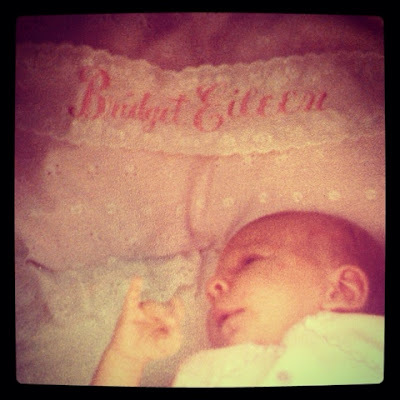 "Posing under the banner of my homepage (www.bridget-eileen.com) since 1978"
#babypic #throwback I found this picture in my baby photo album. I think my baby pillow, from my Gramma Eileen, was in the back of my mind when I designed the logo for my website, because they match! I still have that pillow, but not the "Bridget Eileen" emboridered banner. I lost it, sadly.